I have had many martial arts teachers in my life, most of whom were Chinese. Even those Chinese teachers who could speak a little English did not have a total command of the language, so communication was always a challenge. I could only copy what the teacher showed, leaving most questions unanswered. The questions had to wait until a Chinese student who understood English was able to translate for me. However, even when answers were obtained, they were not detailed answers. There are terms in Chinese that are difficult to translate into English. I have seen even Chinese teachers differ in their opinions on the translation of a Chinese character. You see, Chinese characters don't always translate to a single word, but rather to many various symbolic meanings. With over 50,000 characters in the Chinese language, perfect translations can become a near impossible task. So, in order to open better communication with a Master, there are a only a few solutions. One option is to learn how to read, write and speak one of the many dialects of Chinese, preferably the same dialect that your teacher speaks. If you pick the wrong dialect, you might as well have learned to speak French, because your teacher will still not understand your questions. The second option is to study under an American-born teacher. Now all you have to do is find an American teacher who has all the skills and knowledge of the philosophies of the art you seek. This is not a simple task. I had this chance when I found my one and only American-born teacher, Grandmaster John McSweeney. John McSweeney has trained with some of the best in the field of martial arts. His most famous teacher was the late Grandmaster Edmund Parker, who brought the art of Chinese Kenpo to the United States. Parker has a rich heritage passed down from William Chou. Parker was not only a master practitioner of the arts but he also had a vast wealth of knowledge in Chinese history and traditions which made him one of the most sought after instructors in America. Among the first to learn from Parker was Master John McSweeney. John, being a well-educated man, and a physical strong and capable man, was quick to drink up Parker's knowledge and skills. John McSweeney was born in Brooklyn, New York. His father was an attorney and his mother was a school teacher. John was raised in the a tough city neighborhood, and fought for his survival. He always had an interest in the pugilistic arts, having taken lessons from his father. When he grew older, he joined armed forces boxing teams. He excelled in his boxing career and won many of his encounters. This is what lead him to further his training with the study of Judo and Jujitsu, although by 1959 he had given up Judo, finding it to be too much of a "sport". 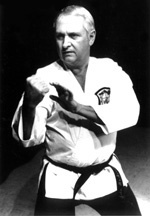 His instructor in Jujitsu was Gene Combs, a Master Sergeant in the U.S. Army and head of the Jujitsu team. Gene was a back belt in the Aichido Jujitsu style. He was a tough man, and fully capable of handling anyone with his Jujitsu knowledge. Gene took a liking to John's skills and his determination to learn and master his art. He taught John long and hard until he finally realized he had shown him all he could. However, John was still eager to learn more, so Gene recommended that he next study a hard hitting art, such as Kenpo, to enhance his knowledge. Gene felt John's hitting power would be ideal for such an art, since that was what John did best. He recommended Ed Parker, whose reputation as a fighter was well known by martial artists. Master McSweeney sought out Ed Parker, who was easy to find, since he was the only one teaching this art in Los Angeles. John introduced himself to Parker. Parker took an immediate liking to McSweeney. He saw in John the quality of man he was looking for to pass his art . John McSweeney recalls during his interview with Ed Parker how Parker kept walking around saying, "John McSweeney, I know that name from somewhere". Parker felt there was some kind of link between them he could not put his finger on. But, he knew he liked John and therefore took him under his wing to study his Kenpo style, and the birth of a new Kenpo Master had begun. Master McSweeney always had a deep respect for all his teachers. There were no ritualistic ceremonies between John and his teacher. Parker, with all his knowledge and skills, was a man's man. He was easy to talk to and it was easy to understand his views on the art. Between the two men was a simple bow for respect, and the rest was man to man instruction. Master McSweeney saw in Parker something he wanted for himself, the knowledge of Kenpo that Parker possessed. He felt Parker looked, acted and proved his ability more than once. John said, "One night we were all practicing at Parker's school, and a big tough looking man who towered over Parker entered the school. Parker approached the stranger and asked if he could be of any help. The man stared down at Parker and asked if this stuff was any good in a real fight. Parker knew he was there looking for trouble. With one quick devastating blow Parker K.O. 'ed the stranger. "As he lay on the floor unconscious, Parker requested that I and a few other students drag him outside and leave him in the lot next door to the school. The stranger was out cold and lifeless. He might have been dead for all I know. What I do know is that we never heard from him again." This was the Parker way. He was a nice enough man, but when it came to fighting, few could equal him. His reputation as a hard hitting knowledgeable martial artist was without question. This is the very reason even the noted singer Elvis Presley hired Parker as a personal body guard. John McSweeney was one of the first in a group of Americans that Parker taught. At this time the Parker name was mainly known to those who lived in Los Angeles. The Ed Parker studios always drew from the cream of the crop for students. Master McSweeney took full advantage of all his exposure to the other martial artists who came to Parker's school. He studied and trained with the best of them. John McSweeney made close ties with many Chinese Kung Fu stylists such as Jimmy Woo, a White Crane stylist, and James Lee who later became a training partner with Bruce Lee. In fact many of his former classmates became quite well known, with such names as Al and Jim Tracy who now run numerous martial arts schools throughout the country, Dan Inosanto who became the conservator of the Bruce Lee art of Jeet Kune Do, and John Keehan, who later became known as Count Dante. Master McSweeney did not waste time. He eagerly mastered technique and form until Parker finally awarded him his approval for Black Belt rating.
" He was promoted to Shodan by Ed Parker in September, 1962 after having received the unanimous approval of the entire Kenpo Yuudansha which included Grandmaster James Mitose and Grandmaster, William, Professor, K. S. Chow, among others. And he was issued the first IKKA (International Kenpo Karate Association) certificate and given the first rank of Shodan in the IKKA." According to historical records gathered by the Tracy Brothers, the highest ranking students of Grandmaster Edmund Parker are: James Ebrao (Senior Ranking Back Belt under Parker), Al Tracy (Second Ranking), and John McSweeney (Third Ranking). John McSweeney's name has been added to the Kenpo hall of fame. Recently, through the effort of such people such as the Tracys, the Kenpo history being fully told and documented for the American people. There are thousands of Kenpo people in the United States today, but few can claim to have been present at the beginnings of Kenpo in this country. Few can say they had a close relationship with the American founder Ed Parker. Fewer yet can say they have seen the original Kenpo before Parker modified it for the American people. John McSweeney is one of those people. Chinese Kenpo is a very different art form compared to the many hundreds of systems in existence. Many Kung Fu stylists might easily become confused hearing the word Karate associated with a Chinese system. To understand why it is called Kenpo Karate and not Kenpo Kung Fu requires an understanding of the root of the word Karate (which I cannot get into here.) However, once you see the traditional Kenpo which Parker advocated, you can immediately see the heavy Chinese roots and theories. It is practical, fast moving, and powerful. The art is known for its fast hands and numerous fighting techniques. It rarely uses high kicks but rather relies on combinations of hand techniques and low kicking. John McSweeney was perfect for this type of art form. Kenpo complimented John's hitting power and naturally fast hands. This, coupled with John's teaching ability and understanding of Kenpo's in-depth theory, made him a very informative and capable teacher. Master McSweeney could hold an audience spellbound as he described the inner workings and practical use of Kenpo as a defensive art. Occasionally I would assist McSweeney in his Kenpo demonstrations. I recall that often John would let some of his strikes hit a bit to demonstrate the power of Kenpo. These strikes left their marks on a person for weeks. To this day he is still a strong man, and even at the age of sixty-nine he can easily knock a man out with one well-placed Kenpo blow. He is the personification of Kenpo, in that he is a perfect reflection of his Master. My meeting with Master McSweeney came in 1963. Then I was a fresh graduate of ten years of training in the Chinese Shao-lin Martial Arts. I often traveled from the lower East side of New York to the Bronx where I was continuing my training at the Temple of Enlightenment. It was there that I noticed a small store front with the heading: Kenpo Karate. When I first laid eyes on John he was sweeping out his newly opened school of Kenpo. I introduced myself to him, but I was really very leery of his credentials, since he was the first Non-Chinese martial artist teacher I had ever met. I was used to Chinese teachers, and along comes this big Irish American, teaching Chinese Kenpo. It did not take long for me to realize how good this man was after he demonstrated his hand speed and powerful techniques. I was fascinated by the many circular combinations of his hand techniques, which reflected what I had learned in the circular Chinese systems. Up until this time, how to make full use of all I had learned from my Chinese teachers had remained cloudy in my mind. Although I had learned a great deal, I was still searching for more insight into better applications for street conditions. McSweeney's Kenpo seemed to be a part of the art I was missing. With its vast array of techniques and in-depth analysis of fighting combinations, I instantly fell in love with the art of Kenpo. I felt that in this art, with a teacher like John, I would be able to truly amplify what I had already learned, and gain a more complete understanding of excellent hand combination. All my knowledge until then was dormant, waiting to be stimulated into action. My Kenpo years under John accomplished that. I learned how to generate more power, and most important, I learned how to take all the movement I had learned over the years and use it to mold and create. By learning numerous techniques one's movements soon begin to happen naturally. Learned, fixed techniques begin to disappear and naturalness takes over. Combinations of hand techniques take on a life of their own. Learning under Master John McSweeney was just what I needed to catapult me into a higher level of understanding of combination movement. What John taught was a direct reflection of Ed Parker's thoughts, techniques and forms. However, John had another great attribute of his own: he knew how to teach and to relate to people. He had a simple hands-on approach with his students. He was always well mannered and eager to answer any questions a student might have. If you didn't know John, you would get the impression that he was too polite to fight. In reality the opposite is true. When provoked, his politeness would totally disappear and he would turn into a motorized, perfected fighting machine. His strength and speed were enough to intimidate any would-be attacker. I learned very quickly not to equate good manners and a sympathetic ear with weakness. John McSweeney has the traits of a polished gentleman, but if the need arises they all disappear and a devastating fighter appears. Master McSweeney did not make a living teaching Kenpo. He had to work to support his family, so his stay in the Bronx lasted only two or three years before his work sent him off to a new city, somewhere in the USA. However, he left three students behind, whom he promoted to teachers, to carry on his art. They were Ed Quinones, an experienced black belt of Henry Cho, Bob Herps, a newcomer to the martial arts, and myself, with a Shao-lin background. Ed Quinones and Bob Herps have both passed away, and, presently only I remain from the original gang of three in New York. John has promoted others to black belts since then. You can find many of the McSweeney black belt levels listed on Ed Parker's family tree, which was printed in Parker's series of books called "Infinite Insights into Kenpo, Volume I." Since my training with Master McSweeney so many years ago I have promoted many students in the Kenpo art. Among the best, are Chris Peck, Phil Sant, Dan Crawford, and Bob Peck. To these I have taught the entire Kempo system. Of course there are others, but these few hold a strong foundation in all I learned from McSweeney. I have never stopped training in Kenpo, even after all these years. In fact, at the American Center for Chinese Studies the Kenpo art is still taught separately, in its entirety, as it was taught to me. I only met Ed Parker once when he came to New York for the East Coast vs. the West Coast Championship Tournament held at Madison Square Garden, in New York City. This tournament turned out to be a landmark event in American martial arts history. Here is where all the best martial artists from both the East and West Coasts came together to compete. Some of the best tournament fighters of the time were there, Ed Parker, Chuck Norris, Mike Stone, George Sanders, George Dilman, George Hamilton and Aaron Banks. The list goes on with far too many names to mention. Anyone who was anyone in the martial arts in the U.S. was there. It only took one meeting with Parker to see John McSweeney's heritage. There is a saying in the arts: "look at the student and you know the teacher." John's heritage was immediately apparent. Although I did not study with Parker, I was lucky enough to have studied with one of his top protégées. And so the Kenpo lives on because of people like John McSweeney, who continues to travel around the country teaching the theories and skills of Kenpo. Since the death of Ed Parker, many of Parker's original students have moved on, forming their own organizations. In fact there are many new Kenpo organizations now in existence, some of which profess to teach the so called Original Style, as it came from Chou. Others follow the so called Traditional Style, which Parker created. However, John McSweeney follows neither. He rarely displays the old Kenpo forms anymore. He leaves that to the Black Belt teacher levels he has promoted, and his organization called the American Kenpo Association, which he now runs out of Florida. He personally prefers at this stage of his life to perfect the hand weapons of Kenpo. John himself said recently at an A.C.C.S Seminar in New York "I am not an expert at forms. Some people can tell you all there is to know about forms. I am beyond forms, I am no longer a forms man; I am a hand weapon man. I can tell you how to hit, and hit hard. I can show you how to double effectiveness." Of course Master McSweeney would never say to forget all Kenpo forms. On the contrary, he also believes the best place to start training is in the structured learning such as traditional Kenpo. I am sure John would say that only from structure can non-structure come into existence. Today, John himself is teaching only the cream of what he learned. This alone keeps him busy traveling from school to school lecturing and teaching his concepts. Recently he has been teaching what he calls his Tiger Movements. These are a series of strong dynamic tension movements used to strengthen the body and promote flexibility. John stresses how his special movements invigorate our natural chi flow, keeping us healthy and strong. When Master McSweeney teaches a class, he always stresses the importance of proper hand weaponry. John once said, "You will seldom see written in books what I teach you. I have torn every movement down to its most basic parts, and only use the best of it. It does not have to be complicated, just powerful and effective." John McSweeney enjoys sharing what he has learned from his Kenpo training. I have heard him say, if I might paraphrase the Master's words, "My training has lead me to this point in my life, and it suits me perfectly. You may end up at a different point, but it will surely suit your own natural abilities. This is the beauty of our art. It has something for everyone." Master McSweeney never looks down on anybody's preferences in the arts. He feels they all have their own good and bad points. It is just a matter of sorting out what is good for you. A student's life is influenced by his teacher's knowledge. This is the reason I still teach the entire Kenpo system as originally taught to me by Master McSweeney. Today Kenpo is very popular in this country. Because of people like John McSweeny, the Kenpo secrets are out of the closet. He continues to spread his message of strength and power through training. He will never stop teaching-- he can't. It's in his blood. As long as one potential student exists, John McSweeney will teach. He has left his mark on me. Today I can say without reservation that without my exposure to John's teachings I would not have made it to the levels I have achieved today. I am proud to have Grandmaster John McSweeney as part of my heritage. For more information on Grandmaster McSweeney purchase his 1989 publication, "Battleaxe."